Property was great, we've stayed there twice. There was an older gentlemen who was very friendly and got us some regular coffee when we asked for it. He was super nice and very accommodating. Awesome property, views of the lake were incredible. House was in great shape, bathrooms were clean and spacious. Kitchen had basically everything we needed to cook for a weekend. The house was beautiful, not too difficult to find. The neighbor's dog Oliver was really sweet too. One issue we had was that the downstairs bed was really difficult to sleep on (creaky, felt loose). Also, the BBQ is on the patio next to a large pine that had dropped a lot of needles, I felt it was a bit too close to that tree and that if anything went wrong it would be a fire risk. Even with that, it was a beautiful place. Beautiful and very private setting. Nice, comfortable lake home. Lake is both peaceful and beautiful. 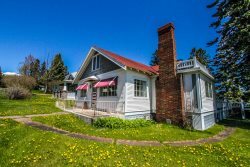 Convenient to Lutsen, just 4 miles away. We would like to stay at Maple Haven again in the future. We had difficulty locating the garbage drop off in Tofte, and in the end it wasn't open despite what the signage said. (The phone number provided was answered by someone in Grand Maria's who knew nothing of the Tofte location.) Thankfully one of your staff was able to direct us to a home where we could bring the garbage. It took nearly an hour to finally drop off the garbage and be on our way. We have rented many, many places on the North Shore, and Sunrise Hollow is absolutely one of the very best. It is very clean and well-maintained and it has an air of hospitality and character that can't be beat. The proximity to the water and the amazing shoreline are spectacular. The guest cottage brings a wonderful added touch. Highly recommended! Your team was great and very responsive. Thank you! Loved every minute at Basecamp. We couldn't get the dog out of the water! She loved her vacation too! Thanks so much! One small suggestion, an outdoor thermometer would be awesome! We went from summer weather to Fall weather during our stay and always wondered about the outside temperature. Our interaction with your team, from the first contact to the last, was super good. The location of the Chateau was perfect for the day trips we had planned. The view from our condo's deck, right on the shore, was terrific and the sounds of the surf made for a great "go to sleep" lullaby. The people were friendly and helpful with the few questions we had. All in all, we will most likely come back again. We've been working with you company for two years and they've always been very accommodating and helpful. We were very very happy with this property. Location was great right on a walking path and the view of the water was lovely. The house was very clean the beds were comfortable and the kitchen is stocked with everything we could want. Very cute cabin, perfect for our north Shore vacation.